Purina Exclusive Pet food – Adult chicken and rice. Mansfield Feed Mill offers Strategy GX Horse Feed. Whether you’re looking for growth, show, performance, recreational, or breeding, Purina Strategy GX Horse Feed is the pelleted diet that offers a balanced, highly digestible nutrition every horse needs. Thanks to quality protein levels, vitamins and minerals, vegetable oils, and strategy horse feed’s nutrient blend, we’re sure that we have the feed to to offset common nutritional deficiencies. 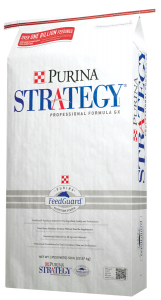 Now with improved levels of amino acids, vitamins and minerals, plus with the FeedGuard Nutrition System now is the time to rely on Strategy horse Feed. Crude Protein (min.) 14.00%, Crude Fat (min.) 6.00%, Calcium (Ca) (min.) 1.00%, Phosphorus (P) (min.) 0.60%, Crude Fiber (max.) 12.50%, Calcium (Ca) (max.) 1.30%, Zinc (Zn) (min.) 280.00 ppm, Copper (Cu) (min.) 80.00 ppm, Selenium (Se) (min.) 0.60 ppm, Vitamin A (min.) 3,000.00 IU/lb. Feed at regular intervals (at least twice daily). When feeding rates exceed 1% of body weight, three daily feedings are preferred. Do not allow free feeding. Have plenty of fresh, clean water available at all times. Prevent the rapid eating by the horse of any feed stuffs. After observing the horse for a period of time, the amount fed may be increased or decreased gradually to obtain the desired body condition and weight. If recommended feeding rates do not yield the desired results, ask your Purina Mills Representative if another product may be more appropriate. Please consult the tag sewn onto bag for complete feeding recommendations. 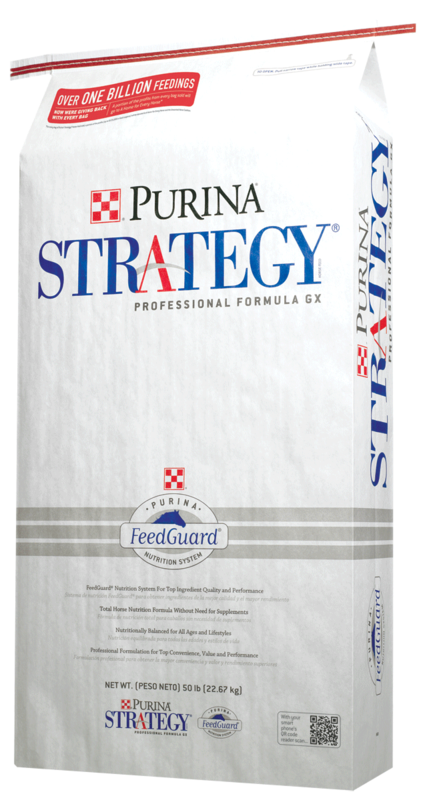 Have any questions about Strategy GX Horse Feed? Shoot us an email or give us a call at 817.473.1137. We hope to see you soon!